Buzz Words: I Spy Dad! None of these dads belongs to our narrator — where could her dad be? She keeps looking and the list of dads grows longer until she spies her own dad at the end of the book. Stewart’s artwork is a great match for the rollicking rhythm and rhyming text. Lively illustrations show families from a variety of cultural backgrounds having fun together. 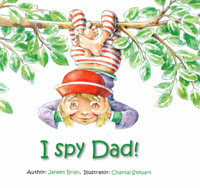 This is a new paperback edition of a picture book favourite, and the companion to I Spy Mum! by the same creative partnership. Perfect for three to six year olds and a joy to read aloud.